Developed in 1932, this may have been а straight copy of the T-3, even down то the 166kW (350bhp) V-12 Liberty petrol engine with maximum road speed on tracks of 65km/h (40mph) and on wheels of 105km/h (65mph). Some assert that the BT-1 was in fact the designation for the original Christie vehicles (read also Christie tanks). Whatever tbe truth. the tank had a crew of three, weighed 10,200kg (10 tons), was 5,49m (18ft) long, 2,23m (7ft 4in) wide and 1,92m (6 ft 4in) high. Maximum armour protection was 13mm (0,51in) and minimum 6mm (0,24in). The armament consisted of two machine guns. Only a small number were built at the: Kharkov Locomotive Works (KhPZ Nr 183) to evaluate the basic design. Using the Same hull as the BT-1, Soviet engineers (read also The Red Army) mounted a 37mm (1,46in) M1930 gun with a co-axial 7,62mm (0,3in) DT machine gun. The 37mm gun had 96 rounds and the machine guns 4000. It entered service in 1932, and some were still in armoured divisions in 1941. The first three prototypes were completed without armament, and they took part in the November Revolution Parade in Moscow in 1931. The more powerful armament raised the vehicle's weight to 11,000kg (10,82 tons) but in all other respects it was identical to the BT-1. The BT-2 was capable o f 110km/h (68,4mph) on roads, 50km/h (31mph) cross-country and had a road range of 300km (186 miles). Drive was on the rear sprockets and via a chain link ro the rearmost road wheels when not running on tracks. It had clutch and brake steering and mechanical brakes. 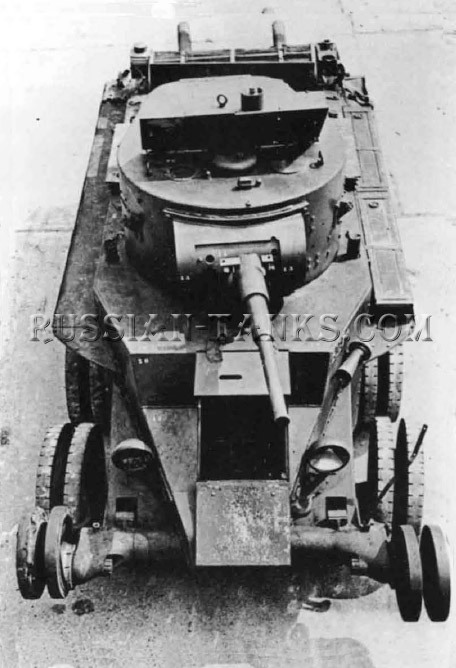 A machi ne-gun armed version of the: BT-2 with three DT guns was not popular with crews. 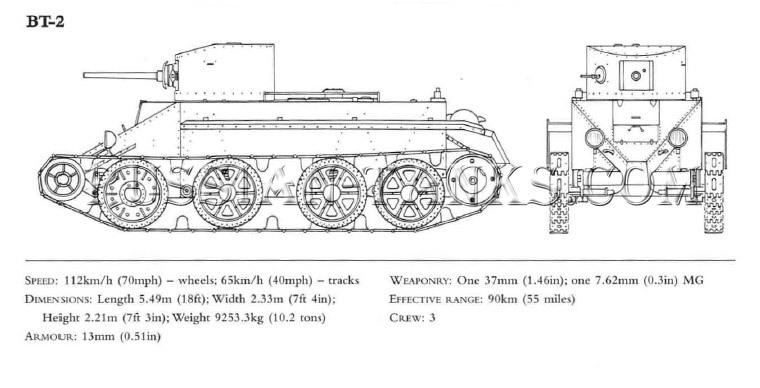 The BT-3 was a further improvement on the BT-1 with solid disc roadwheels in place of spoked, and a 45mm (1,77in) gun in place of the 37mm (1,46in). Only a few were built and, along with T-26s and T-28s, most were later modified as bridgelayers. A small number were modified with a flamethrower replacing the main armament. The BT-4 was a prototype with a twin DT machine-gun turret. This tank went into production at the end of 1932 in a new factory in Kharkov and brought together all the lessons learned so far in the programme. It would be the backbone of the Soviet Army Armoured force in the late 1930s. About 50 BT-5s were sent to Spain to operate within the assembled Russo-Spanish Republican tank units. The tank had a crew of three, a larger turret with a 45mm (1,77in) M 1932 tank gun, and a co- axial machine gun. It carried 72-115 rounds for the 45mm gun and 2394 for the machine gun. It also had a new and more powerful engine and better vision equipment. The M-5 aero engine, a V-12 petrol, was capable of developing 260kW (350bhp), and on tracks the BT-5 was capable of 65km/h (40mph), and on wheels a remarkable 112km/h (70mph) on roads. The maximum armour protection was now 13mm (0,51 in) and minimum 6mm (0,24in) and it included a riveted glacis plate. The tank weighed 11,500kg (11,31 tons). It was the same length and width as the BT-1, but the height had increased to 2,21 m (7ft 3in), The BT-6 or BT-5 (V) was the commander's version. It had a radio in the turret bustle and a frame antenna which, when fully rigged, extended around the turret sides and rear. Small numbers of BT-5 tanks were used for trials and experiments (read also Light tanks). 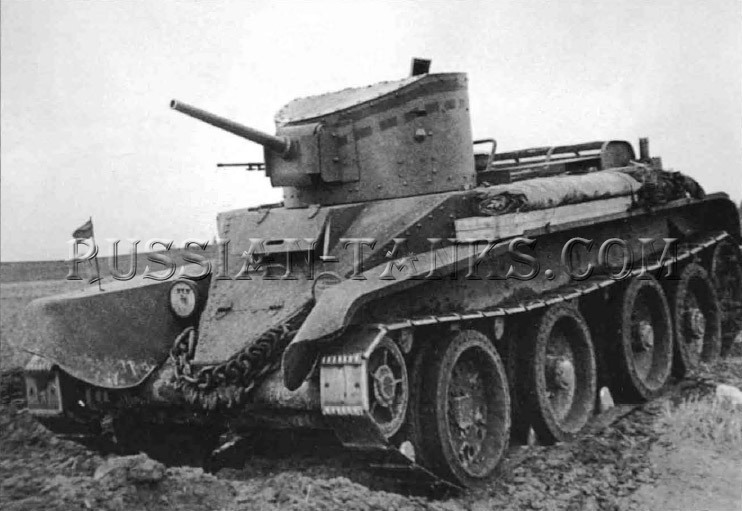 The BT-5PKh was fitted with a snorkel and rubber sealing for crossing rivers under water. 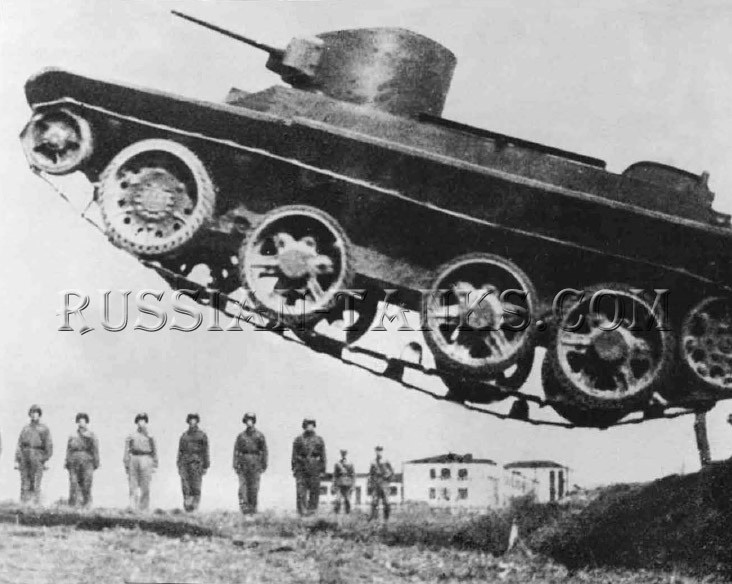 The 4th Motorized Regiment, part of the 4th Don Cossack Division, tested BT-5PKh tanks in the 1936 summer manoeuvres in Byelorussia near Slutsk. A flamethrower version had the flame projector mounted in the hull, allowing the gun to be retained. However, the fighting compartment became so cramped that it was almost impossible to service the gun. BT-5s saw action in Finland, but the close woodland and the crews' tactics exposed them to Finnish infantry tank-hunters. BT-5s were used for trials as armoured engineer vehicles carrying fascines for filling in antitank ditches and bridges. The tracks were fitted with primitive grousers. which were called 'supplementary track', to assist movement across snow or soft ground.